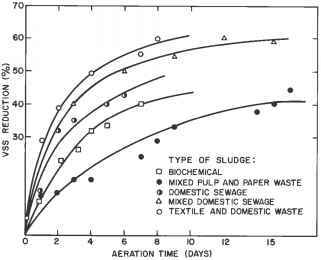 In the aerobic digestion of primary sludge, the primary sludge acts as a food supply for microorganisms. 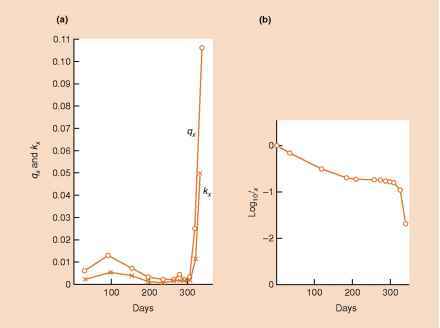 During the initial stages of aerobic stabilization, assuming an unlimited food supply with sufficient nutrients, the bacterial growth is limited only by the microbial rate of reproduction (log growth phase). Figure 7.44.2 shows this phenomenon. The oxygen uptake rate continually increases due to the increasing population of new bacteria. FIG. 7.44.1 Typical VSS reduction by aerobic digestion. FIG. 7.44.2 Aerobic biological treatment. As the surrounding food supply in the aerobic system becomes depleted and cannot supply sufficient organic matter for synthesis and energy, the rate of cellular destruction exceeds the organism growth rate. Although this phase of the metabolic cycle is generally referred to as the endogenous phase, it cannot be regarded simply as a period for individual cells using internal cellular carbon sources. The reason for this phenomenon is because a heterogeneous population of microorganisms is present, representing a complex ecosystem in which various microbial species serve as food for other members of the population. Eventually some organisms undergo cellular lysis, releasing protoplasm into the environment; the protoplasm is then used by other bacteria. 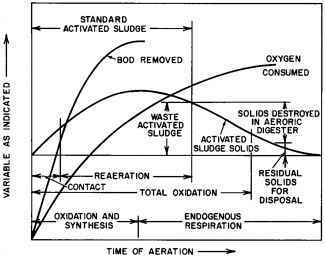 Aerobic stabilization of primary sludge results in a high F/M ratio in the aeration basin. Therefore, organic material in the primary sludge converts to bacterial cell material by synthesis, and the resulting change in the total VSS concentration is minimal. Hence, destruction of the bacterial cellular material requires long detention times.